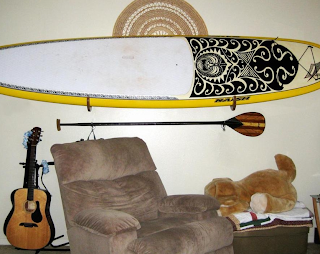 If you got a new standup paddleboard for Christmas or the holidays, or if you've had some SUPs but realize you need to take better care of them, check out this functional and affordable wooden paddleboard rack option for storing your paddleboards. My husband purchased two paddle boards without really thinking about storing them. We live on the beach, which is great for having boards, but we live in a condo, which is the worst place to store a board, we have no storage. For the last two years we talked about hanging them, and looked at racks, but we never made a move in that direction, what we did was store them behind our couch, they are 11 foot boards and 31 inches wide,,, so imagine that. MY HUSBAND LOVED THEM. HE LOVED THE WAY THEY LOOKED AND HOW FUN THE BOARDS LOOKED ON THE WALL... 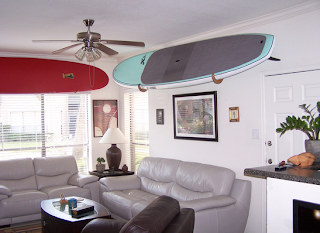 I now have my living room back,, no more boards behind the couch...,,, my friend who hung them is ordering the racks for his boards, he loved them. Thanks Stephanie! That rack is a great SUP storage rack and we've got a number of other paddleboard racks to check out if you're looking for something other than wood, for multiple paddleboard storage, for ceiling storage, or other paddleboard storage options.